"Alessi's warm compact sound and easy flexibility allow him to cruise through even the most demanding of these works seemingly without difficulty, and the level of musicianship is naturally first class." 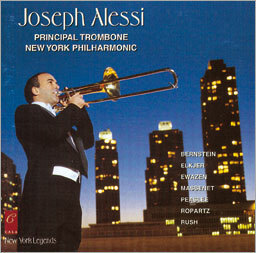 Cala Records presents the second in the twelve compact disc series New York Legends, featuring Joseph Alessi, Principal Trombonist from the New York Philharmonic. His style and his seamless interplay between classical and jazz techniques perfectly suits the repertoire on this disc, as he effortlessy explores the full range of the trombone. This recording was made to reflect Mr Alessi's strongest artistic convictions as it surveys the most creative trombone music in the repertory.